Step back in time to the way Jamaica used to be. The south coast is hassle-free, unspoiled Jamaica at its best. You'll escape the mainland in private verandas and find solace in evenings spent on the thatched roof terrace under the moonlit sky. 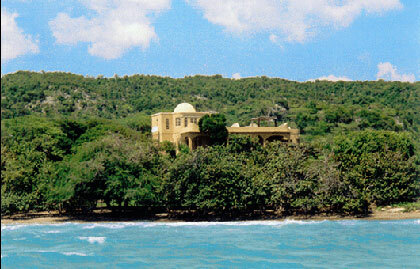 The Buccaneer Villa overlooks the ocean in beautiful Treasure Beach, Jamaica. Where you will enjoy reggae drifting on the breeze, fresh fish from the sea, and sandy white beaches on a stretch of private, undeveloped land. Discover the simple pleasures of life in Treasure Beach, Jamaica. The Buccaneer Villa is perfect for travellers seeking a destination spot on Jamaica's unspoiled southern coast with breathtaking ocean and mountain views. Marvel at the 360-degree view overlooking sparkling, turquoise waters. Soothing ocean breezes will lull you to sleep in the hammock by the mangroves, unwind in the sanctuary of the Buccaneer Villa, decorated with an exotic Bohemian flair. All rooms in the villa are air conditioned and have glorious expansive views. Even more inviting are the tropical breezes drifting from room to room. The clusters of colorful stone and clapboard rooms with mosaic-tiled showers bring the Southwestern theme to life. Beautiful Jamaican paintings and furniture colorfully decorate the villa. The luxurious master suite overlooks the ocean. And, from the master suite shower, open the floor-length window to let the ocean breezes flow inside. You can also shower outdoors, just off the bedrooms. Host your Caribbean special occasion at this villa. Contact us to book.